A great skin care regime consisting of medical grade products can deliver noticeable epidermal and dermal improvement. Medical skin care is essential support to any of the treatments we provide at Infinity and assists with faster recovery and result longevity. Not every molecule is created equal. CosMedix chirally-correct range of skin care contains a range of products containing the most effective form of the active ingredients, such as vitamins A and antioxidants such as vitamin C.
Cosmedix also has a range of peels to address skin concerns more quickly than using skin care products alone. Among the many great products in the CosMedix range Rescue contains all-natural blend of cherry bark extract, willow herb and copper peptides in a soothing shea butter formula quickly restores your skin to its healthy best, which is used to help recovery after laser treatments. CosMedix Products are cruelty free and vegan. Australian owned ASPECT DR formulates clinical skincare products to support the skin. This wide range of active products will address all types of skin conditions and concerns. The ASPECT DR has a range of peels to address skin concerns more quickly than using skin care products alone. 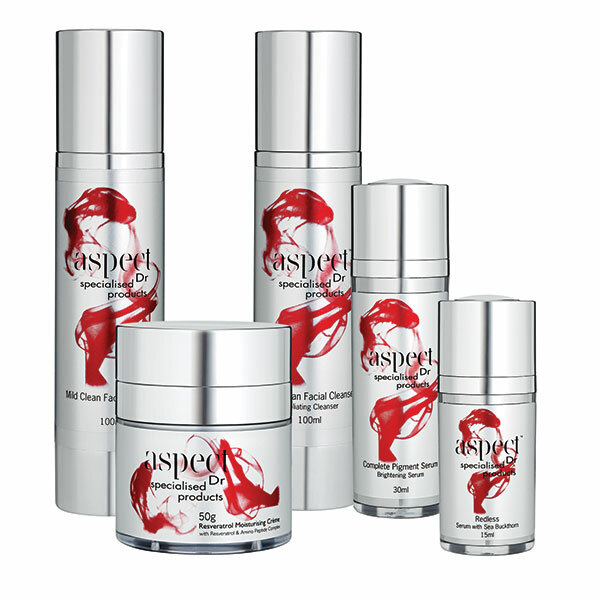 ASPECT DR is a cosmeceutical grade skin care range only available in medical clinics. ASPECT DR Products are cruelty free and vegan. Synergie combines cutting edge scientific breakthroughs with naturally derived ingredients to protect, change and nurture skin. All products are innovated and formulated by founder and cosmetic chemist Terri Vinson.